In late February, construction began on a test facility that will be used to demonstrate a CO2-capture process being developed by JGC Corp. (Yokohama, Japan; www.jgc.com) and Japan Oil, Gas and Metals National Corp. (JOGMEC; Tokyo; www.jogmec.go.jp). When the Texas-based facility is completed, it will operate for one year to demonstrate a zeolite-type membrane for removing CO2 from associated gas that is generated during petroleum production. The site produces 3 million ft3/d of associated gas. For the demonstration, the facility will use DDR-type zeolite membranes, which have been under development since 2008 by JGC and the ceramics producer NKG Insulators, Ltd. (Tokyo; www.ngk-insulators.com). The test will confirm the performance of the process using large-size elements (180 mm dia. ; 1,000 mm length) of the DDR-type zeolite membrane. The separation process (diagram) has been jointly developed by NGK and JGC since 2008. The DDR-type zeolite membranes will be manufactured by NGK using its advanced membrane-production technology. The membranes’ “outstanding” CO2 selectivity and high-pressure resistance have been verified in tests carried out at the company’s research facility. JGC expects the process can be applied for both CO2 recovery from associated gas during oil production, and CO2 removal during natural gas processing. Current methods generally use polymer-membrane separation processes for the former, and chemical absorption processes for the latter. However, these methods both have drawbacks. For example, significant deterioration of polymer membranes often occurs when the associated gas contains high concentrations of CO2, resulting in costly membrane replacement. 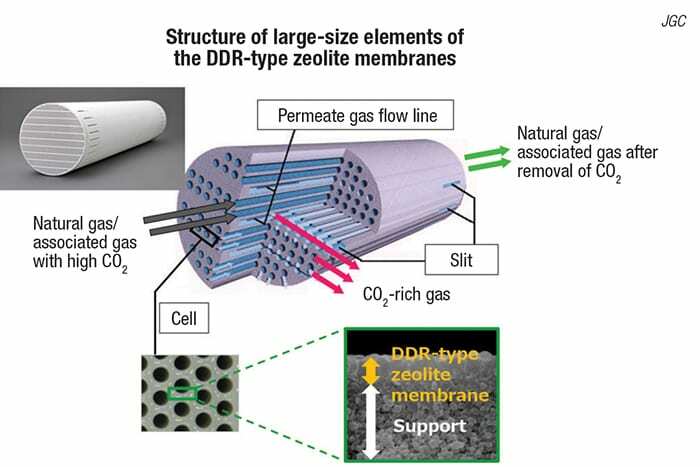 In contrast, the DDR-type zeolite membrane is highly durable, even under high CO2 concentration conditions. High CO2 concentrations in natural-gas processing can also lead to increased costs associated with chemical absorption methods, due to increased solvent usage and energy needed for solvent regeneration. For this application, the zeolite-based membrane could be used before the absorption step to significantly reduce these costs.